In 2010, Apple announced a plan of opening 25 stores in China by the end of 2012. Today, Apple has five retail stores in China, two in Beijing, three in Shanghai, but none in South China region where major cities such as Shenzhen and Chengdu are located. 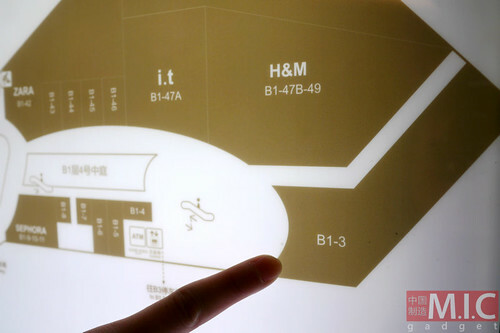 At around this time last year, we covered Apple’s plans of expansion for their retail stores in China. We reported that Apple is considering to open new stores at three big cities of Southern China — Chengdu, Shenzhen and Guangzhou. First, both Shenzhen and Chengdu are special because they are the sites of Apple’s partner manufacturing facilities, and the iPad’s production line is based in Chengdu. Secondly, as spotted by several Chinese netizens, the China-based subsidiary of Apple is hiring new personnel for its Apple Store in Beijing, Shanghai, Shenzhen and Chengdu. And they also have new job postings on the Apple’s Chinese site. Check out some screenshots we’ve captured in the gallery below. The words circled in red represent Shenzhen and Chengdu. Here’s the first question which come through our mind when we see the jobs listings for Shenzhen: Why would Apple build a store right outside of Foxconn factory? Well, it is worth noting that Shenzhen is the main point of entry for grey market products (especially iPhones and iPads) into China… With an official Apple store in the city, grey market resellers would have a difficult time selling their products immediately. So Apple would have both the Hong Kong and Shenzhen side of the border covered (it takes less than five minutes to walk the bridge between Shenzhen and Hong Kong). 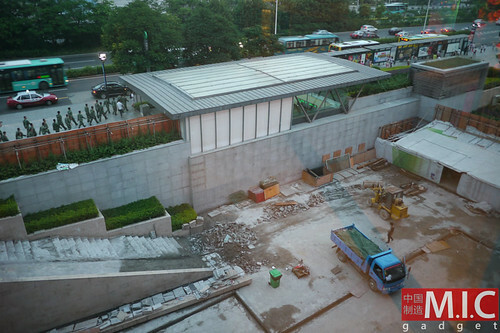 So let’s talk about the upcoming Shenzhen Apple store. We pinned the location down to Yitian Plaza. Yitian Plaza is a newly constructed group of buildings in Shenzhen. It has hundreds of shops, a cinema, restaurants and a nice skating rink. It covers 35,000 sq/m and has a total of 135,800 sq/m coverage. It is a very important shopping mall in the Nanshan district of Shenzhen. Also, many rich people live in this part of the city so the demographics are very good for high end retailers. Most important, the Apple store is as usual an anchor store. However, we did get our exclusive photos. 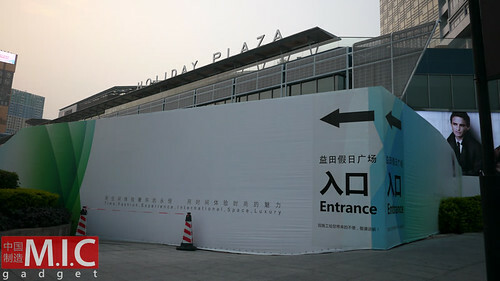 An area outside Yitian Plaza has been boarded up with white construction barriers. Looks like the Apple store will be located at the large space outside the building of the mall. This is what we see behind the construction barriers. We’re not sure if the whole space is reserved for the Apple store. It’s gonna be a two level Apple store. 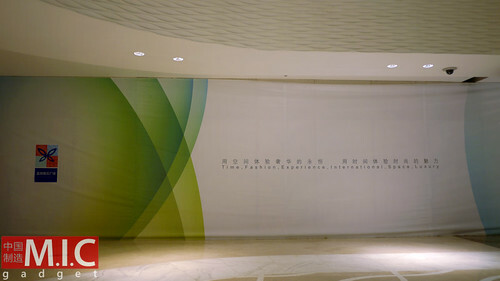 This should be the entrance of the store on the first floor of Yitian Plaza. There’s probably no space for queuing up inside the shopping mall. And there’s Starbucks right beside the Apple store. The floor plan of Yitian Plaza. The Apple store will be located at the area we’re pointing at. It looks very small to us actually. Perhaps this is just the first store? Keep in mind that an average Chinese Apple store has 4,000 people in and out everyday. That’s 4x the number of a normal store in the US. It’s actually quite convenient to reach the Shenzhen Apple store. 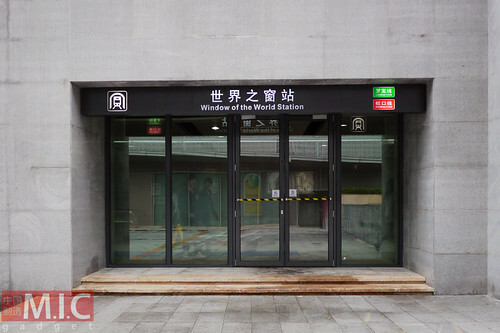 Just take the subway and alight at the Windows of the World station. So when is it opening? 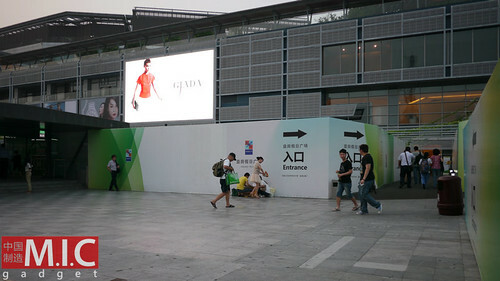 Well, not so soon, maybe this will be the seventh Apple store in China, opening in Q4 2012, or Q1 2013. Moving To Chengdu, we mentioned two sites Apple was looking at. One at Raffles Square (still in construction) in Wuhou District. As mentioned before this is an extremely high end area of the city. Our analysts predict high profitability for this area. 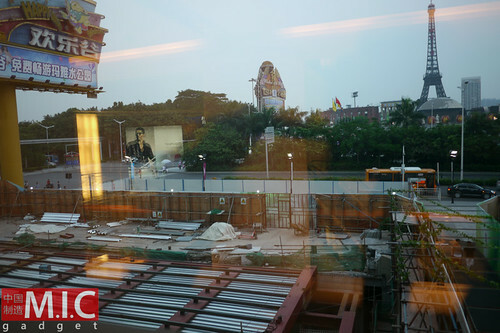 Below is a photo of the Raffles Square. According to our sources, the Raffles Square will be opening as soon as September. It’s currently in construction and near to complete. Next, the second will be on Chenghua district in the high end development MixC city. It is a 2.5 million square foot complex for shopping. Again, following Apple modus operandi, it is in a high end area, with many rich people in the demography of the area. Below are some photos we took at the Mixc city. We have found for our real estate contacts several things about both these leases. Both have negotiated rent for long term as an anchor store, thus making better pricing over the long term. 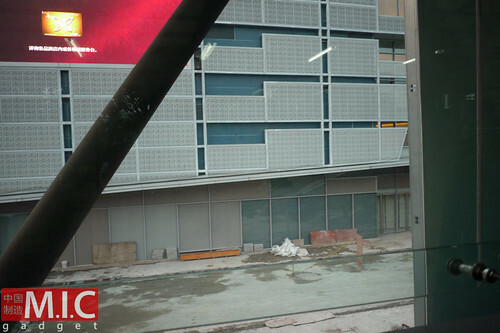 Also, the Apple Store at MixC city will be huge (up to four levels! ), and it will be similar to the Pudong Apple Store or the one at Nanjing Road in Shanghai or the IFC center in Hong Kong. It will be opening as soon as December, after employees completed training program (starting in August, see here) in Beijing or Shanghai during November. 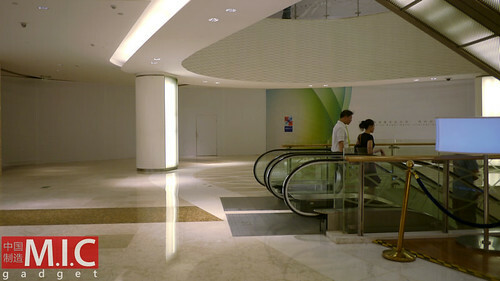 As for the one in Raffles Square, it will be a midsize store, like the one at Hong Kong Plaza in Shanghai. 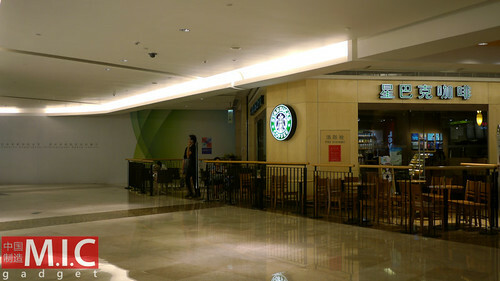 new Apple Store will be located at Tianhe district in GuangzhouNot to be left out we move yet again back to Guangdong. It was mentioned previous that Guangzhou would be blessed with a mid size store in the new Grand City Plaza area, located in Tianhe district. This is an area rich with technical companies, gadget shops of all stripes and a really great night scene, with many night clubs. Although renovations have not been completed (click here to see concept shots of the new Grand City Plaza), our contacts have told us that an Apple store will be moving into the Grand City Plaza area as an anchor store after renovations have completed. Rent has not been negotiated yet. Being Apple’s fastest growing market China has had many other interesting things happen with store development in other cities as well. Take Dalian, a major port city known far and wide for its beauty, located in Liaoning province. It has had the honor of having an even bigger Apple store than the one in Shanghai located on Nanjing road. It is of flagship caliber. And you will remember the fiasco that happened with regard to the two warring malls that happened recently there. 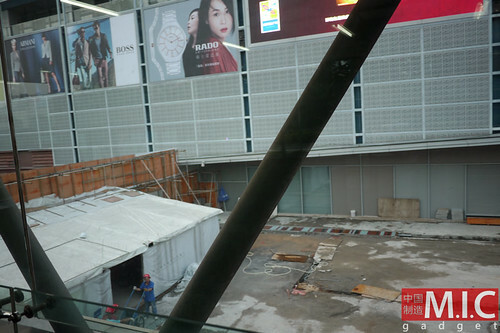 security guards mess up upcoming Apple flagship store in DalianThe store has negotiated rent and is an anchor in Parkland Mall, located in Zhongshan District. It will be the world’s biggest Apple store, but we still don’t have clues on when it is opening. And Dalian is actually a city which have many foreign investors from Korea and Japan, and with the fact its relatively near to the city center, where as always the demographics are of rich people our analysts here at M.I.C. predict a very high profitability ratio. Last but most certainly not least, we go back to Hong Kong. You will remember way back we reported two Apple stores would be opened in Hong Kong — one flagship at IFC mall, and another one at Hysan Place. 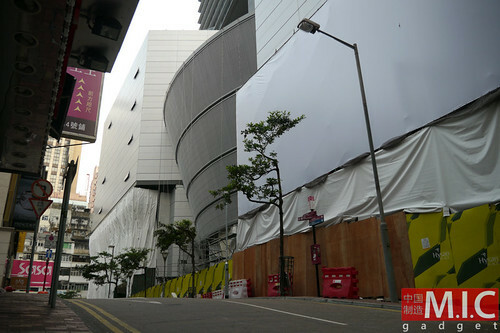 We expect this to still follow through, as construction is proceeding at a very steady pace at Hysan Place in Causeway Bay (most popular shopping district in Hong Kong). 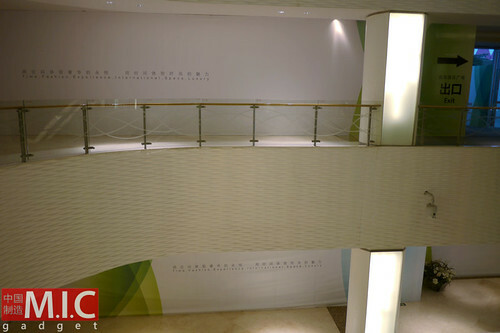 Below is a gallery of photos we took at the Hysan Place. Currently under construction, Hysan Place is a multi-story office and retail tower set to open at the end of the year, and according to insiders, the construction of the shopping complex will soon be completed as soon as August. Well, we hope it can meet its targets and be open by late 2012 or early 2013. Despite it being close to the IFC store, because so many mainlanders come to Hong Kong to shop, the lines are always very huge. It means Apple can have a better grasp on the situation in Hong Kong. We predict a very high profitability ratio for this one as well. Please keep in mind that Apple, they don’t hold stocks of iPhones in their stores due to scalpers. The Chinese people don’t like to buy online generally either. 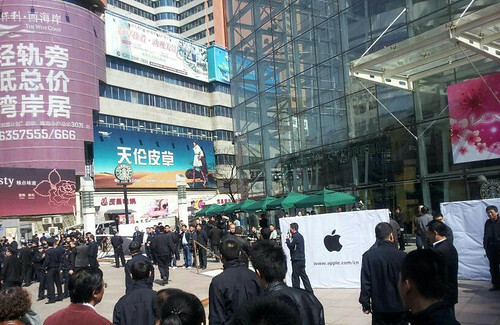 Think back to the violence at Beijing Apple Store that leads to egg-throwing, Apple definitely doesn’t want this, or the scalping issue happening again. They can only solve the issue by having stores literally everywhere with supply keeping up with the demand. Step by step they are doing this, and killing the grey market slowly. That’s our real estate report for China’s Apple stores, we will update you as we know more. Our Hong Kong editors Chris Chang and Herman Lai contributed to this report.